Now the dust has settled and the most lucrative spectacle in combat sports history is over, most have moved on. Not Floyd Mayweather Sr., however. It seems that even bringing up the name Conor McGregor is enough to make the elder of the Floyds fly off the handle. Both men had their own runs ins, verbally clashing before and throughout the Mayweather vs. McGregor presser run, with the UFC lightweight champion coming off better. Mayweather Jr’s father and trainer appears to have had the last laugh, however, as he claimed that the legendary boxer was only at ‘half’ of his optimum level in the money-spinning bout. While, with retrospect, many can point to the limited footage released of Mayweather training before the bout in comparison to McGregor as backing up Floyd Sr’s claims, it is more likely to be salt rubbing on his part. “Floyd would have stopped [McGregor] a lot earlier if he worked even a little bit,” Mayweather Sr. told Phillyvoice.com. “Floyd did not train for that fight – he literally whupped that boy, that’s what he did. Just imagine if my son would have prepared and would have trained the way he [normally] would for a fight, he would have stopped [McGregor] even sooner. It is extremely unlikely that Mayweather Jr. would have neglected training as he is known for his strict dedication to fitness and keeping himself in shape, even in retirement. The 40-year-old is one of the hardest working men in boxing history. There is a catalog of footage which can easily be found online of the Grand Rapids-native running throughout the night in the warm desert heat of Las Vegas or punishing himself with grueling workouts in the early hours of the morning. McGregor, ironically enough, had put in a massive amount of work for the bout yet indicated signs of fatigue towards the end of the third round. The Irishman’s camp was dedicated, for once, to training for just one discipline in comparison to his standard MMA camp for UFC bouts. While he had a comprehensive conditioning and dietary regime, McGregor still looked unprepared and unconditioned, despite being, at 29, 11 years younger than his opponent. Mayweather Sr’s claims may be hyperbolic exaggerations, but there may certainly be an element of truth to them. Mayweather Jr., despite the pre-fight niceties and fight hype, never feared McGregor as a threat. “The Notorious” may be a formidable force in MMA, but he never was a boxer. “Money” is without a doubt the greatest fighter of his generation and has dispatched legends of the sport, monsters in comparison to McGregor, with relative ease. 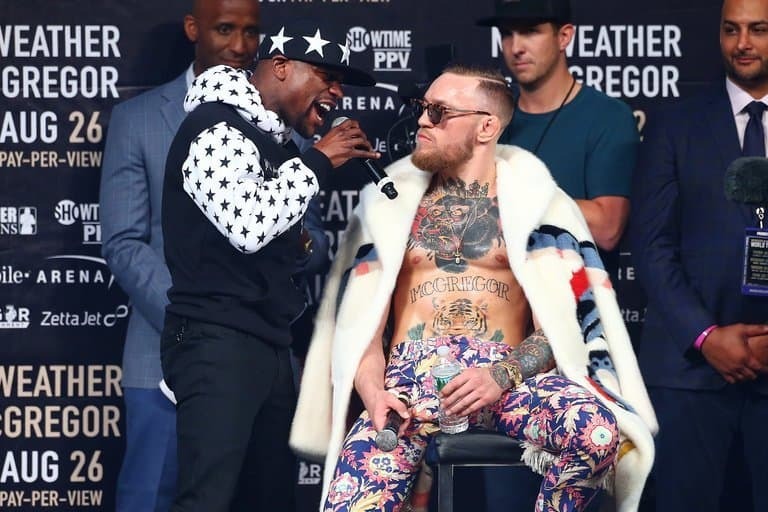 While the fight may have looked a promising prospect to McGregor fans, there was never any hope of Mayweather losing to those who know him well.